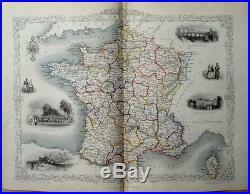 FINE ORIGINAL 1851 ANTIQUE TALLIS RAPKIN MAP OF FRANCE. FINELY DETAILED NINETEENTH CENTURY ANTIQUE ENGRAVED MAP OF FRANCE WITH ORIGINAL OUTLINE COLOUR ENGRAVED BY J. RAPKIN AND PUBLISHED BY J & F. TALLIS, LONDON, EDINBURGH & DUBLIN IN 1851. A finely detailed double-page nineteenth century steel-lined engraved map of France drawn and engraved by J. Rapkin and published by J & F. Tallis, London, Edinburgh & Dublin in 1851. The map with some original outline colour and with several finely engraved decorative vignette views drawn by J. Wray and engraved by J. Rogers including the Bridge of Toulouse, Calais Harbour, Palace of Fontainebleau, all contained within decorative engraved borders. The map with engraved printed title and separate scale of distance. 245mm x 330mm (9.5in x 13in) with margins. A generally VG+ bright impression with centrefold as issued. All maps will be sent out in board-backed envelopes for extra protection. One of the most popular cartographers of the 19th Century was John Tallis, a London publisher. Tallis was renowned for the very accurate and visually most attractive maps and views of all world areas during the Victorian Age. His star engraver and map maker was John Rapkin. During the mid 19th Century many books of travel and exploration were published by Tallis, using the extraordinary artistic and engraving skills of John Rapkin. Beginning in 1851, John Tallis & Co. Issued their Illustrated Atlas, which contained maps of all parts of the world. These detailed maps are particularly prized for their decorative borders and the small finely engraved vignettes of indigenous scenes, people, etc. Generally regarded as the most decorative mid 19th Century Atlas map of its type. GUARANTEED GENUINE ANTIQUE ENGRAVED MAP FROM 1851. I endeavour to describe items as accurately as possible using industry standard grading and my feedback speaks for itself. Europe Printed Papers (2-5 days). And the Rest of the World Airsure Printed Papers (up to 5 days). How will you know when your item has been sent? How long will the item take to arrive? About Us: I have worked within the Rare and Secondhand book industry in the United Kingdom for over twenty years, including as a cataloguer and auctioneer for one of the UK’s leading Book Auctioneers. I have also been a bookseller of rare and out-of-print books, along with good quality maps and prints during this period. I aim to provide excellent customer service coupled with the human touch. However, you can also telephone me (number on request) in the event of an urgent or unresolved query. Track Page Views With. Auctiva’s FREE Counter. The item “FINE ORIGINAL 1851 ANTIQUE TALLIS RAPKIN MAP OF FRANCE” is in sale since Wednesday, January 31, 2018. This item is in the category “Antiques\Maps, Atlases & Globes\Europe Maps”. The seller is “r8227139″ and is located in Wiltshire. This item can be shipped worldwide.